Well what a fantastic Easter that was for Saints fans. 2 good performances leading to 2 wins. Even I smiled. There are several things you can level at Justin Holbrook. One of which he is consistent in team selection – he doesn’t change things just for the sake of it. This has been evident all season and to no-ones detriment more than Aussie centre Ryan Morgan. Morgan suffered a broken nose and concussion in the round 1 fixture against Castleford, and we all expected him to return as soon as he was fit. After all, he’s a recognised right centre. However, the team was winning and playing well, with Tommy Makinson doing a good job in his place & the recalled Adam Swift in something like the form he showed a few years ago. It’s taken an injury to the unfortunate Swift for Morgan to come back into the team – and this was not without debate. It’s fair to say the majority of fans called for Morgan to drop straight in with Makinson returning to the wing. However, after Jonny Lomax’s assured display at centre versus Hull KR, it might not have been a surprise to see him line up there against Wigan on Good Friday. As it was Morgan got his chance over the Easter period to reclaim his shirt. Would he be rusty? Would his confidence be low? Would he slot straight back in like he’d never been away? Hindsight is wonderful isn’t it. I sit here writing this and wonder why any bits of doubt should creep into my mind. The aforementioned Swift slotted straight back in with no issues when Morgan was injured. Morgan Knowles likewise when back from suspension. There is something in the water at Saints that is keeping the players raring to go. And while he wasn’t man of the match on Good Friday, that honour should have gone to James Roby, Ryan Morgan was very good indeed. Yes there was a mistake or two but he, for the main, looked assured & confident. He might have been running low on fuel towards the end of the game, but he still had the energy to break and set up the field position for our winning try. The fact that Morgan was conditioned to slot straight back into the team is down to the backroom staff at Saints. For those who missed it, head physio Nathan Mill and Matt Daniels, head of strength and conditioning, both graduated from the University of Chester with MRes (Masters by Research) qualifications. First of all congratulations to them both, but also, well done to the club for supporting them through their course. It seems all that Nathan and Matt have learnt is being put into practice, and hopefully – when the time inevitably comes – the players waiting in the wings will be as ready as Messrs Morgan and Swift. 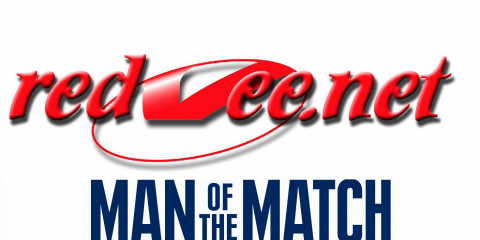 I said in the Redvee TV meets Wigan Fan TV Preview that the Good Friday game would be decided by our pack matching Wigan’s and who’s back 3 was the most potent. I know it’s hardly the most incisive prediction in the world, but I’m happy to get something right every so often. I might also have been the only Saint in the world who thought this – but I was disappointed Sam Tomkins was missing for Wigan. My reasoning for this is he is in form, and I wanted to see the battle between the two form full backs in the competition. 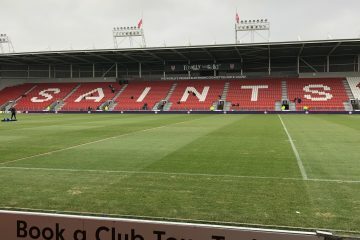 Fear not though fellow Saints, my disappointment lasted for merely seconds – this turned into mirth after 18 minutes when Ben Barba left Tomkins’ replacement, Morgan Escare, that twisted and turned the poor lad spent the next 5 minutes trying to find his way back into the stadium. It’s an absolute privilege to watch Barba this season in the redvee. He pulls strings you didn’t even know were there, it’s almost as if he watches the game in slow motion while everyone else is in real time. One of the great things about Ben Barba, is everyone is in play when he’s on the field. Everyone has a chance of getting the ball from him. Everyone has the chance to score. Everyone has confidence. While I don’t think Makinson himself has been short of confidence, the fact the team is now swinging the ball out to his wing rather than to the left is a great sign. His kick returns have been great for years now, and we all know he’s the best finisher in the game. So it was great to see him with two ‘Makinson specials’ against Widnes on Easter Monday, bringing up his 99th and 100th tries for the club. We have great players in our back line and seeing the right side utilised more will make us more unpredictable to the opposition going forward. We have finishers in both centre positions and on both wings, it’s great to see them all on the scoresheet over the weekend. The Totally Wicked Stadium was rocking on Good Friday and it was excellent to be part of it. It just shows what a winning team, a world class star and the club engaging with the community can do. A lot of credit must go to the club, from Eamonn McManus & Mike Rush through to Justin Holbrook and Steve Leonard’s Community Team. 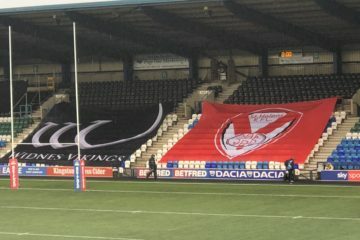 It’s always a delight to have the stadium packed out with buoyant Saints fans who are in good voice. I’m not going to go down the road of asking where these fans are every week – after all a bank holiday at 3.15pm is a lot easier to attend for most than Friday at 8pm. Not everyone can afford to attend every week either, so it is remiss to insist on fans attendance all the time.